Also known as ‘Aghios Nikitas‘, this beautiful destination is the only village at sea level on the West coast of Lefkas island. Little more than 10km from Lefkada Town, the islands capital, Agios Nikitas is easily accessible by main road from both the North and South. There is also a mountain road from the East coast, via the village of Karya, but it is not much faster than driving around the island via Lefkada Town (although the scenery is superb). 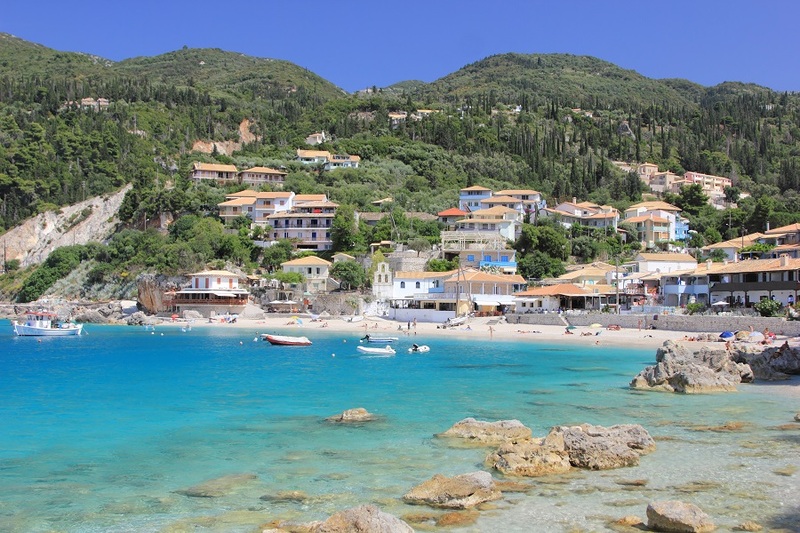 Some of the main attractions of Agios Nikitas are its beauty, tranquility and close proximity to some of the best beaches on Lefkada. The village consists of one main street starting at the top of the village, where it meets the main road, leading down the sea and a small beach. The main streets are lined with smallshops, minimarkets, and several good restaurants and bars. There are a few large hotels and apartments, several small hotels and a ot of villas on the hills surrounding the village. The main season in Agios Nikitas, July and August, is VERY busy. At these times it can be very difficult to find any car parking. During the other summer months it is much quieter and more relaxing. The scenic (but slower) route is to turn right after crossing the bridge, then immediately left. This will take you around the ‘Gira’, the coastal perimeter road, past the windmills. If you continue to the very end it will bring you back into Lefkada Town from the West. At the ‘T’ junction, with the town hall on your left, turn right. The follow the signs after a few hundred metres, turning right for Agios Nikitas. Alternatively turn left after the bridge and follow the causeway into the town. After you have crossed the little bridge turn left through the ‘Old Harbour‘ and follow the road signs at the traffic lights (that don’t work!). The road out of Lefkada Town climbs quickly, with beautiful views to the mainland and the North. After 5 km you will pass through the village of Tsoukalades. Two kilometres later you will pass a large car park on the right. Stop here and admire the beautiful view down the west coast to Agios Nikitas with the fantastic beach of Pefkoulia below you. Another 5 minutes drive down to the beach and along the coast to Agios Nikitas. 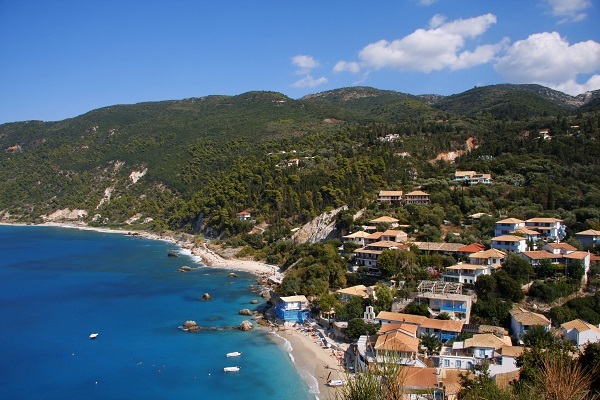 Some visitors to Lefkada arrive by ferry from Keffalonia or Ithaka and arrive at Vassiliki ferry port on the South coast. 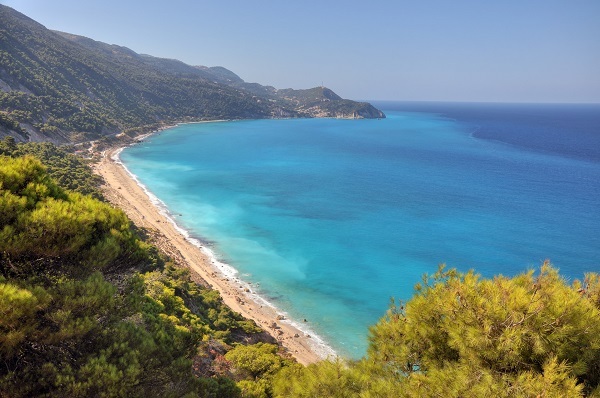 From Vassiliki to Agios Nikitas is a beautiful drive along the West coast main road, and from this road it is also possible to take smaller roads down to some of the most beautiful beaches on Lefkada; such as Porto Katsiki, Egremni, Gialos, Kalamitsi and Kathisma. The first part of the route is West from Vassiliki village, along the main road behind the beach. At the end of the beach, passing through the tiny village of Ponti, the road climbs steeply to the village of Aghios Petros. Continue climbing and the road stops climbing. You will pass a junction with a road to the left signposted ‘Athani’. This is the road to Porto Katsiki and the lighthouse. Don’t take this road. Continue North following the roadsigns through Kalamitsi and on to Agios Nikitas. If you are staying in Agios Nikitas you will drive back this way many times to visit the beaches. Agios Nikitas is not a party town! Apart from that all things are possible. For some people a relaxing holiday means staying local – a short walk to the beach and plenty of nice tavernas and bars nearby. If that is what you like then Agios Nikitas is perfect! The main street is quiet and mainly pedestrianised. 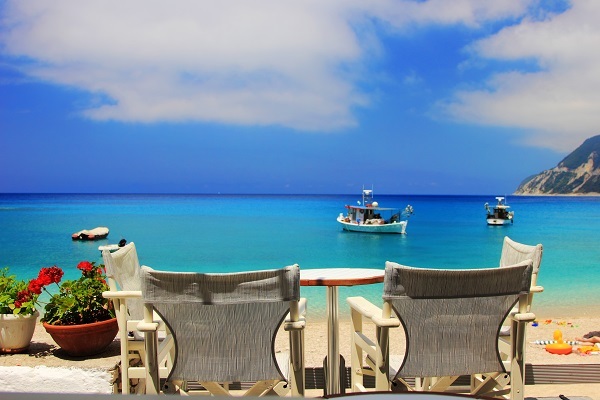 All the local tavernas and bars are excellent; whether you are looking for a simple Greek saland and Amstel for lunch or a delicious home made meal at night. At the end of the main street is the ‘town beach’ of Agios Nikitas – beautiful clear fresh water for swimming. There are just a few small boats moored off the beach. 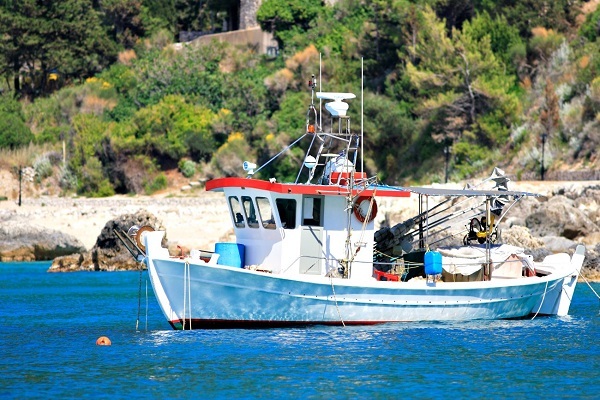 A few are still fishing boats but most of them offer a shuttle boat service to the two local beaches of Milos and Kathisma for those who do not want to walk or drive. If you are someone who likes being active then there are some good walks to two local beaches; Milos and Pefkoulia. Milos is directly to the South of Agios Nikitas – over the headland. The footpath starts half-way down the main Street behind a taverna. Beware! It is very steep and very hot in August. But, once you pass the windmill at the top of the headland (Milos means Windmill) you will be greeted by a magnificent view over Milos beach. Bring a picnic and something to drink. Pefkoulia beach is directly to the North of Agios Nikitas, along the main road. It is about 30 minutes walking or 10 minutes by bicycle. There is a good taverna on the beach with sunbeds and umbrellas and Pefkoulia beach is fabulous! Finally, if you have a car and like to explore, you have access to all the wonderful beaches on the West coast of Lefkas. You can also take the mountain road (steep) directly into the beautiful centre of Lefkas.